The root of Stellaria dichotoma L. var. lanceolata Bge of family Pink. Inner Mongolia Autonomous Region and northwest of China. Collected in spring and summer when plant sprouting, or in the end of autumn when stem and leaf withered. Light smell, slight sweet taste. Even volume, fine root bark, solid texture, gray-yellow peel, yellow-white cross-section with center in chrysanthemum-like shape. 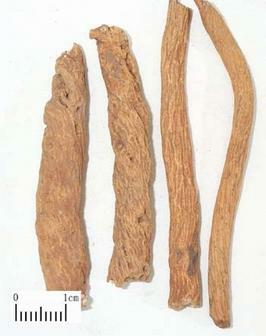 Dried after throwing the extra stem, fibrous root and sands away; sliced and unprocessed. Sweet, slightly bitter, light cold; liver and stomach meridians entered. It mainly excels at clearing deficiency heat, relieving malnutrition fever, and is commonly indicated for syndrome of liver and kidney deficiency manifested as bone-steaming, strain fever, tidal fever and night sweat. It is often combined with yin-nourishing and heat-clearing herbs such as Bie Jia and Di Gu Pi in Qing Gu San from Zheng Zhi Zhun Sheng. 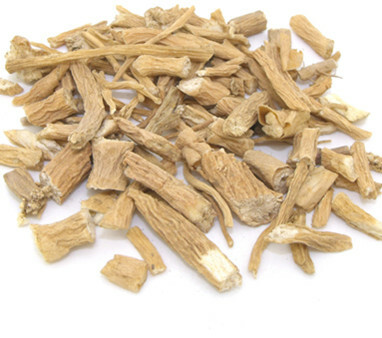 For the residual pathogenic in terminal stage of warm diseases manifested as lingering lowgrade fever, it is often combined with herbs in fragrant nature and clearing action so as to get reinforcement, such as Qing Hao, Bie Jia and Mu Dan Pi, etc., for instance, it is combined with Bie Jia in Yin Jia San recorded in Wen Zheng Zhi Gui (Guideline on Epidemic Warm Disease). Furthermore, it is also excels at reducing malnutrition fever. For food or parasite stagnation induced children's malnutrition fever, abdominal intumescence, emaciation, thirst and withered hair, it is often combined with spleen-invigorating, qi-tonifying, digestant and vermifugal herbs to mutually take effects of resolving food-stagnation, killing parasites, invigorating spleen and curing malnutrition. For instance, it is combined with Bai Zhu, Shi Jun Zi and so on in Chai Hu Qing Gan San recorded in Yi Zong Jin Jian.